Sydney Shop Girl: After The Cup. For us humans, Melbourne Cup Day is that one Tuesday of the year where it's perfectly acceptable to get dressed up to the nines, have champagne with lunch (or at morning tea instead of your regular coffee order), have a bit of a flutter and make some headlines. The three minute, two mile race that starts at 3pm seems a bit of an afterthought. The day's celebrations often unraveling by around that time anyway when an early finish at work or finding a taxi go get you home from a Cup Day function are of more pressing importance. The aftermath of this year's race for the horses who competed was somewhat more dire than being stranded with aching feet from your heels and a touch of sunburn to add to the beginnings of an epic hangover. 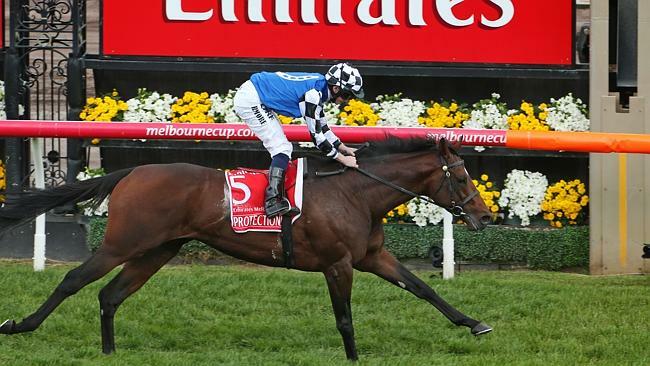 Pre race favourite, Admire Rakti from Japan died suddenly after coming last in the race. Early interviews given by representatives of the racing industry suggest that the cause of death was a form of sudden cardiac death syndrome. Araldo, another competitor had to be put down after he startled and fractured a leg in a freak incident involving a member of the public getting a little too close with a waving flag. In all our rush to get caught up in the glitz and glamour of a day that only came about because of our mastery over another species, have we neglected to consider if we do enough to protect the health and safety of the real stars of the day? Are there better ways to monitor the health of horses undertaking a gruelling international racing schedule? Should the public be kept even further away from the exhausted horses after their race? If only horses had voices. I don't care for horseracing. I don't see a great deal of difference between it and cockfighting. I don't like standing outside for long periods in heels and a frock. I would go to a marquee for the people watching, but would feel miserable and fat and want to go home. Actually, AFL footballers are treated like racehorses, often encouraged to go on when injured, or patched up. It is such a shame what happened to the horses. Makes me remember last year, there was a fatality then too and it did bring the day into sharp perspective. Something that brings so much joy shouldn't cause so much pain to the stars, but I'm really not sure what the answer is. A toughie. Don't start me on the scourge of gambling....it's just a vicious cycle - schools get funding from Pokie machines profits in QLD!!! Those pictures of mess to clean up make me very thankful I'm not the one responsible for it! I used to go to Derby Day when we lived in Melbourne. It was fun, but the getting home part was absolutely awful. The people watching was fun though. 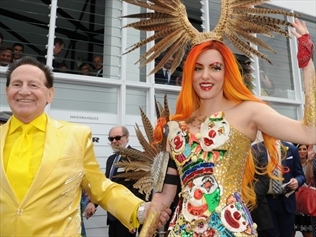 What some people think of as appropriate race wear is interesting to say the least!! It's so sad about both of the horses and kind of changes your opinion on the whole day. I think more probably needs to be done but I don't know what. Horse racing is not a sport in my opinion. Studies show that in the racing industry Australia wide (including all sorts of racing, not just the Melbourne Cup), a horse is euthanized due to injury, not running fast enough or simply being at the end of a career every 2.9 days. That's disgusting. 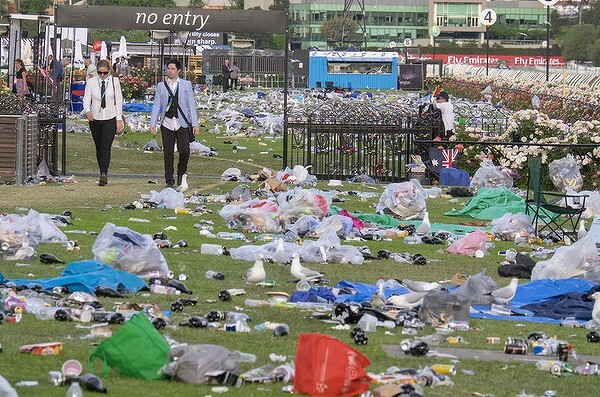 Those pictures of Flemington after race day is the true epitome of how ugly and careless and pathetic humans can be. I have never been to a racetrack and I never will. Watching people get wasted, bet money and becoming drunken idiots saddens me because I'd like to think we are better than that. Clearly most of us are not.